At this critical point, with a rudderless Department of Justice as Mueller conducts one of the most consequential investigations in U.S. history, the best we can hope for is that Barr is true to his word. Many Americans are rightly wary of President Donald Trump’s cabinet nominations at this point. So it was a relief to hear William Barr, Trump’s latest choice for attorney general, pledge to allow Special Counsel Robert Mueller to complete his investigation. “If confirmed, I will not permit partisan politics, personal interests, or any other improper consideration to interfere with this or any other investigation,” Barr said in prepared testimony for Senate hearings this week. Senators will decide whether to confirm the president’s nomination. Share your opinion by sending a Letter to the Editor. Email letters@seattletimes.com and please include your full name, address and telephone number for verification only. Letters are limited to 200 words. 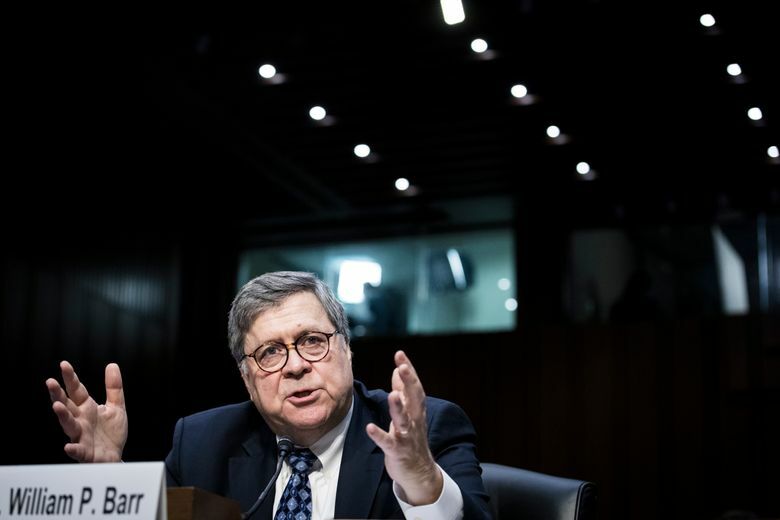 Barr said the White House won’t get final say over what’s disclosed from Mueller’s report. He also dialed down his critique of Mueller’s obstruction of justice probe, saying a memo he wrote about it last June was narrow and based only on publicly available information. These are welcome commitments from a person likely to be the nation’s chief prosecutor as the Justice Department concludes its extraordinary examination of Russian interference in the 2016 election and any links to the Trump campaign. Already the investigation has led to more than 30 people being charged, including Trump’s former campaign chairman, Paul Manafort, who pleaded guilty to conspiracy against the United States and conspiracy to obstruct justice. The Democrat-controlled House of Representatives may still pass a law to affirm protection for special-counsel investigations “in a way that can hold up over time and in different scenarios,” U.S. Rep. Denny Heck, D-Olympia, said before the Barr testimony began. That’s worthwhile to backstop Barr’s pledge and reduce the ability of presidents to kneecap uncomfortable investigations in the future. Barr’s comments about transparency need further discussion. Barr’s prepared testimony said the public and Congress must “be informed” of Mueller’s work and his goal is “to provide as much transparency as I can consistent with the law.” Then he testified that Mueller’s report will be confidential per Justice Department regulations, with the attorney general deciding what to release. This will test protocol, since the overarching goal is to expose meddling and maintain trust in U.S. elections. Having any Trump appointee decide how much to disclose about the investigation into his election requires a leap of faith. Barr’s past support of expansive executive power is also a concern. While serving as attorney general under President George H.W. Bush, Barr supported Bush’s pardons of six officials involved in the Reagan Administration’s Iran-Contra scandal. That ended a special prosecutor’s investigation, preventing a trial that could have shed light on Bush’s involvement while serving as Reagan’s vice president. Perhaps Barr’s thinking has evolved. The travails of the current administration should cause advocates of expansive executive power to re-evaluate their stance. Or maybe Barr, a public-service veteran who started with the CIA during the Cold War, recognizes the extraordinary threat from Russia’s interference in U.S. elections and recent success undermining Western liberal democracies and alliances. That demands a thorough, unfettered and transparent investigation to expose what happened, prevent a recurrence and strengthen the integrity our democracy. The Seattle Times editorial board members are editorial page editor Kate Riley, Frank A. Blethen, Brier Dudley, Mark Higgins and William K. Blethen (emeritus).